Why do people think that these roads were built for bicycles? They [cyclists] don't share the road; they dominate the road; they dare you to run them down. And then when you do, they get angry. What is that about? And so you tap 'em. I'm not saying you kill them. I'm saying tap the one. Tap one. So you just pop 'em a little bit and see what happens. Again, what's wrong with the little lane on the right? I don't drive in the little lane on the right. My objection is when they ride in the middle of the road, they give you the finger; they do all the time. They think they own it because they think that you think that you own it. I don't think I own it [the road]. I own it. I have a car. I have a large powerful car compared to your stupid little bicycle. Naturally Tony K's spot generated a strong reaction from rational listeners. 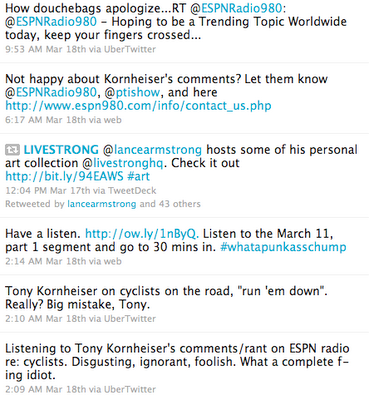 Lance Armstrong responded aggressively on twitter. Kornheiser's "direct thing about, you know, go after bicyclists" was an incitement to violence towards bicycle riders, albeit a chuckling one. But the call to violence isn't the real problem. The real problem is the general motoring public's prevailing view of cyclists, or "the bicycle people," as the others, as a different class of citizen, a class with different rights and protections.